Depending upon your daughter's age and year level, different aspects of school life make a claim on your love and your time. Certainly if your children are in Year 4, you have been supporting your daughters as they receive the Sacraments of Confirmation and First Holy Communion. If your daughter is in Year 10 you would have been watching and encouraging her as she finalised her Report for the MYP Personal Project which was due in on Monday afternoon. We look forward to seeing you at the upcoming Personal Project exhibition. Many school events are across year levels and that is true of Book Week being celebrated across Australia this week. We are watching with interest the upcoming challenge for Year 8s who are taking part in the Kids Cancer Project "Write a Book in a Day." Parents of our Year 12s will definitely be aware that this week the Year 12 Drama Production, "Ruby Moon" will perform for audiences over two nights, Thursday and Friday. We wish them well. Tickets ($12 | $8) are available at the door from 7pm each night. We look forward to seeing numbers of you in conversation with our teachers and your daughters at next Monday's Parent Teacher interviews, and next Thursday's Subject Counselling Day for Year 10 and Year 11. 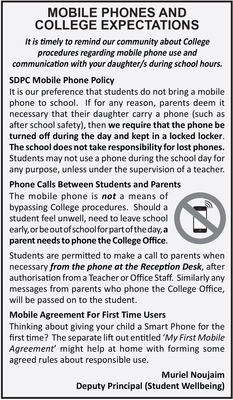 There's a timely reminder about the College's procedures regarding Mobile Phone use and communication with your daughter/s during school hours. Please take the time to refamiliarise yourself with the Mobile Phone Policy as published in today's Bulletin. We give sincere thanks to our Quiz Night committee and generous donors who facilitated the success of Quiz Night | Black & White on friday night. Parents will be very interested to read the annual Commonwealth Compliance Report, which confirms the high standards achieved at St. Dominic's and confirms the factors that generate those standards. It is available online here or by request via the reply slip in today's Bulletin. We congratuate our Primary Poets who placed 1st, 2nd and 3rd in the Poetry Section of the SA Young Writers Awards. Week 6-10 Wednesday Lunch Specials are published. As we look towards the upcoming Dominican Cup Debate at Blackfriars (date TBD), we wrap up the 2017 interschool debating competition with some impressive results. Year 12 Drama Production of Ruby Moon commences Thursday 24 August and concludes Friday 25 August. For more information, visit the event page. The 2017 Old Scholars Association Luncheon is on THIS SUNDAY: 12:30pm at Barton's Restaurant (Caledonian Hotel North Adelaide). Tickets ($30ea) are available from the College Office, or at the door. This week's Fete Appeal is for TINNED FOOD. Get the Week 5, Term 3 Bulletin online now.